From the North Korean leadership school of modesty, here’s the first review I’ve seen of my Advanced Digital Black and White Photography. 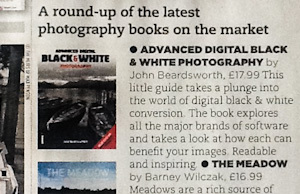 It’s from last week’s Amateur Photographer and is short and sweet – the book’s “readable and inspiring”. Like the first edition, it is an end-to-end treatment of the subject from camera to print. In between it covers every known method of doing black and white in Photoshop, but most of all it tells you which ones are now best forgotten, and why. The first edition was bang up to date when it was first published and so was the first book on B&W to feature Photoshop CS3’s B&W Adjustment Layer – as well as Lightroom and Aperture. That content is now updated, and there’s a lot more material on Lightroom and Silver Efex Pro. It now seems to be available at Amazon UK and Amazon US, and translated versions will follow – including Korean.